Two kilometers offshore of Lands End in Cornwall, England resides a bubbling outcrop island of porous rock. On this island, at the top of the highest peak, at the end of a wind battered path, sits Bleak Man’s Repose, a lighthouse constructed of shipped-in stone and smoothed by 243 years of gales and whipping water. The lighthouse itself was not much to look at, standing out less in the ocean as a homely girl draws attention in Milan. Cylindrical, 33 meters high at lantern level with a diameter of 10 meters at the base and 6 meters at the top. Iron railings encircled the top platform. The light, formerly a fire tended by generations of the Smithwick family and now a solar powered strobe that went off every 5 minutes punctuated by the blasting of a solar powered fog horn, sat beneath the only colorful part of the island: a copper roof installed at some point in the lighthouse’s history (its origins a bit of a mystery, though local lore pointed to the propensity for thieving that the Smithwicks featured on their rare ventures to the mainland). And while the strobe and the horn were fully automated by the grace of modern technology, the island still had a keeper, a root-growing-through-the-sidewalk kind of old man named Boz (no middle or last name–just Boz). He had lived on the island since before the automated light was installed and refused to leave even though his presence was no longer required to tend the light. The administrator who oversaw the functioning and resupplying of the lighthouse had a soft spot for Boz–the man’s way of life was about to be overturned thanks to automation–so he didn’t fight Boz’s insistence on staying. Instead, he cobbled together a new administrative position that removed Boz’s salary but guaranteed constant resupply to Boz’s domain: Bleak Man’s Repose. And so for the next however many years, the little resupply ship sailed from the mainland to the island on the first of the month, every month. And Boz would meet the ship, not say a word, and retreat back to his lighthouse with the government subsidized food and amenities. His resupply requests over the old WWII surplus radio remained relatively constant: beer, bread, the occasional whisky, jerky, “Gentlemen’s” magazines, and toiletries (though it seemed like he rarely bathed or brushed his teeth). Over the last year, however, his requests became… off: cow’s tongue, goat eye, bull testicles, chicken feet, bone meal–the list went on-and-on, and due to the specifications of Boz’s “special” contract, all the ingredients were (begrudgingly) delivered by the little resupply ship. The unfortunate nature of Boz’s requests led to the demand for a copy of Boz’s key to the lighthouse. Boz was none too pleased with the key request, but he assented after being convinced that if something were to happen to him, rescuers would need access. Self preservation is a hefty motivator. Then, after the delivery of a soup pot, three live chickens, two live goats, and palm ash, Boz wisped out of existence with a final transmission: “That will be all, mainland. Out.” No introduction, no requests, just a somewhat directive. All attempts to hail Boz’s frequency over the next month failed. On the night before he planned to sail to Bleak Man’s Repose, the strobe light and fog horn stopped functioning. This malfunction forced Ramsay’s hand and he set out in the dead of night. Knowing the waters well, he did not fear running aground on the island–he only feared a major vessel missing out on the lighthouse’s signal. Unnaturally choppy waters made his encroachment tedious, but true to his experience, he landed at Bleak Man’s dock. 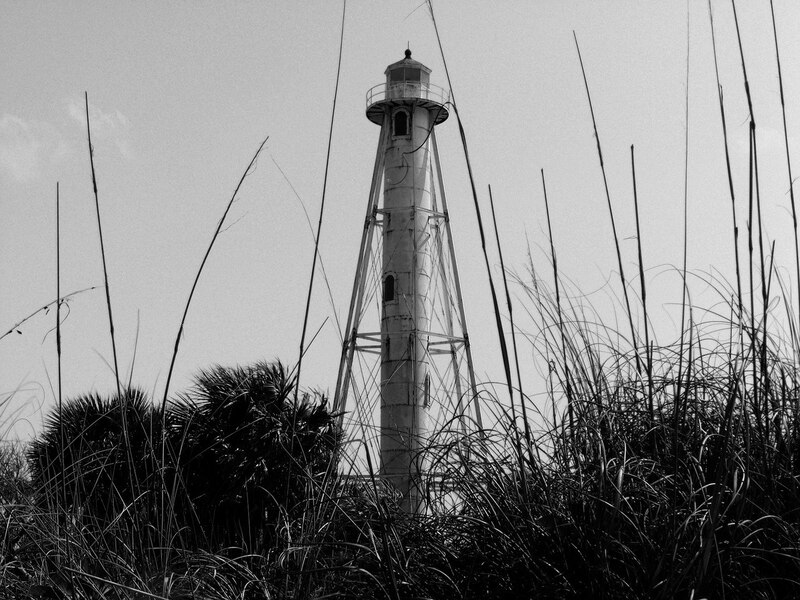 After tying up his boat, he stepped onto the dock and peered up the winding, worming path leading to the lighthouse. Nothing looked different, but he shook as if being blasted by the icy air of a freshly opened freezer… or more specifically, a meat larder. The wind carried to his nostrils the faint smell of decay, of a truck-hit deer left in the sun for just a bit too long. “Hmmph… maybe old Boz killed the animals for dinner.” With a tightening of his jacket, the Captain walked up the path. The smell persisted, intensified to the point that Ramsay felt immersed in it, like he was swimming in putrescence. There was a heat to the odor, a living presence to fetor best left to undertakers. 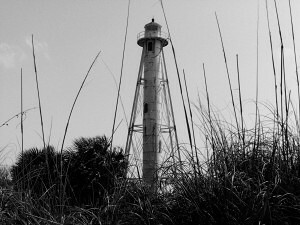 He approached the door to the lighthouse in the oily, immersive dark. He removed a tiny flashlight from his right pocket and the tiny skeleton key to the door from his left pocket. The light illuminated the hand carved oaken door and the ornate brass doorknob. Above the knob, grasping a key and separated from its master, rested a human hand, freshly severed and dripping ever so elegantly through the shadows onto the dirt below. Ramsay gasped, dropping the key and flashlight in the process. He turned, ready to sprint back to the dock, but something latched onto his jacket and threw him down. He scrambled backwards, turning to face whatever it was had grabbed him. His fallen flashlight illuminated the bottom half of the creature and all he could hear was his own breathing echoed by what could only be hundreds of other somethings surrounding him.